Adults lecturing to youth to “eat better and exercise more” is not effective. If this approach were effective the U.S. would not have an obesity epidemic because adults – from health teachers to parents to public health professionals – have been lecturing youth on this for more than three decades (all the while the obesity epidemic skyrocketed). The Caruthers Institute (CI) is a national advocate for youth-led campaigns to address obesity. 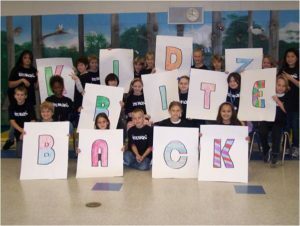 Using his experience from highly successful teen tobacco prevention efforts like the national ‘truth’ campaign, founder Dewey Caruthers designed Kidz Bite Back, a kid-created, kid-led, kid-spread movement for fourth and fifth graders and their families. Regular kids become “Kidz” who educate their families, friends, neighbors and community groups on Big Fat Industries (fast food, soft drink, junk food industries), Couch Potato Companies (national TV networks, video game companies) and the basics of living healthy. Through a 20-minute PowerPoint presentation, Kidz show how Big Fat Industries target children with billions in advertising, marketing and free toys to get them to eat and drink their products in excess – when the only healthy way to consume their products is in moderation. Kidz also educate people on how Couch Potato Companies have literally engineered activity out of children’s lives by encouraging them to sit on the couch watching TV and playing video games – when the only healthy way is to balance sedate activities with more vigorous physical activity. Children led the following positive behavior changes in their families.